I have just spent a delightful weekend at the Benslow Music Course with Tracey Cool, Judith Gregory, Richard Kenney, Adrian Scandrett and Carin Wilkinson, fine students each with quite distinctive personalities of a most attractive kind. I came home on the train with Judith, chatting about this and that, and about cantilevered staircases. What are they, I hear you ask? They are constructions with no visible means of support, which is kind of puzzling. Little did we know then how dramatically a staircase would affect us later in the day - but more of this anon. Deep into a wide-eyed exchange on the subject we realised too late that we were on the wrong London train. Loaded with bags and guitars, plus Judith's push-bike, there was no way we could jump off in time. Instead we travelled on to the end of the line, Moorgate, where seeking ground level we got on the up escalator. The first inkling of all not being quite right was when the bike showed a mind of its own. Instead of up it started wheeling down. Pulled by the force of gravity, it dragged the owner with it. Like a pack of cards collapsing, everything followed with a grim inevitability. The bike sliding away from her, Judith slipped. I tried to hold her, and then I slipped. I let go of my guitar when I felt all was lost and collapsed like a cowboy shot in a spaghetti western. Before you can say how's your father we were both flat on our backs, and thankful for it, rather than tumbling all the way down to the bottom. Total silence descended as the motor shut down and the escalator came to an emergency stop. Miraculously, we dusted ourselves down, climbed up the stilled escalator, apparently no harm done. And that is the story of my hair-raising escape from near death on a London Underground escalator, as two guitars, two bags, a fully-grown adult and one push bike nearly rained down on my unprotected bald personage. But my journey did not stop there. We parted company and I proceeded, got off at my station and stood at a bus-stop. Then it really did start to rain, first in silly spits of drizzle, and after in large dollops, until my shirt clung to me in a mangled soggy mess. Rivulets of rain water formed on my spam and dripped down my nose, creating tributaries and streams all over my face which I could not wipe off because, remember, I was holding a travel bag in one hand and a guitar in the other. Bach's Air on a G string kept going round my head like funeral music. I blame architects for our near disaster. If they didn't build silly cantilevered staircases we wouldn't have missed our stop while deep in discussion trying to understand how they work. Driven bonkers by cantilevers' weird geometry, we ended up in an asymmetrical heap of our own with arms and legs waving crazily in the air. And now this: lashed by wind and rain, soaked to the skin, and carrying my possessions like some poor immigrant new in town. 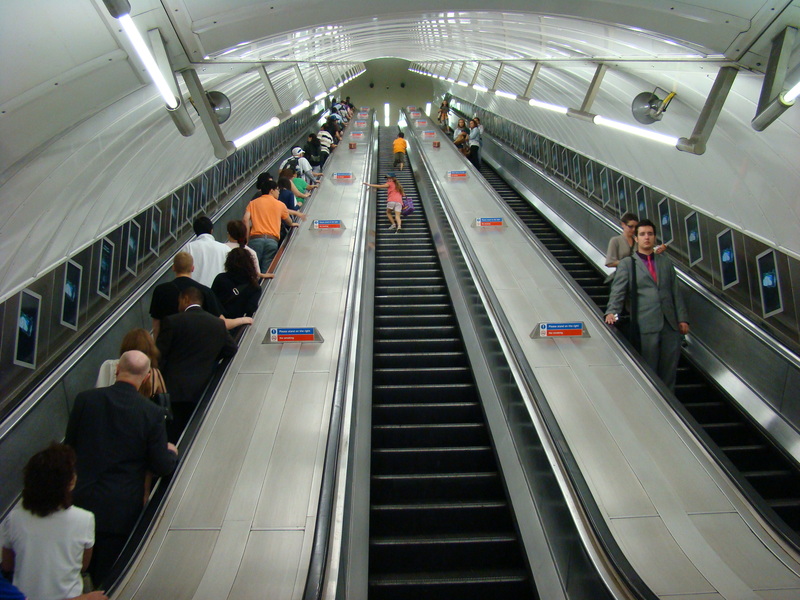 By the way, are the Underground escalators cantilevered and driven into the side panelling with no visible means of support? Don't even think of answering if you are about to arrive at your destination - you'll miss it. My mind boggles what could happen to you next. And anyway, what's so important about how cantilevered staircases work? It's not, like, a matter of life and death. This entry was posted on 16/08/2014 (Saturday) at 12:56 am and is filed under My travels with guitar and the meaning of life from September 2013, Uncategorized. You can follow any responses to this entry through the RSS 2.0 feed. You can leave a response, or trackback from your own site.